Buckinghamshire's Grand Slam Tennis Club - grass, hard court and clay! Summer evening tennis - come and join in! Loads of fun on court with our coaches and BBQ afterwards! 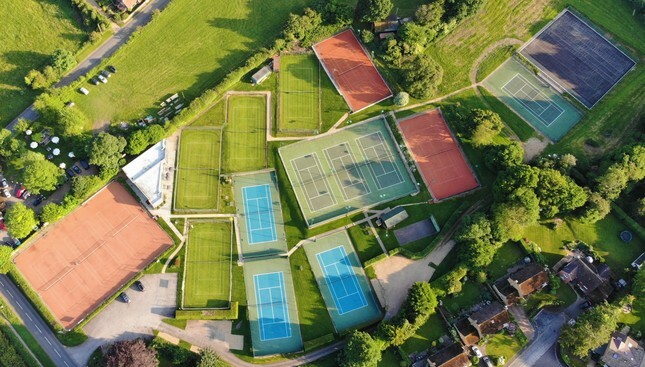 At Great Missenden Lawn Tennis Club we pride ourselves on being a club that welcomes players of all abilities, from beginners to potential ATP tour players. We offer a warm, friendly atmosphere with a vibrant junior and adult membership. Members can use our 18 courts on a "turn up and play" basis with no need to book. Our courts cover the three Grand Slam surfaces with grass (Wimbledon), synthetic clay (like Roland Garos) and hard court (US and Australian Opens) and tarmac. Nine our courts are all weather and six are floodlit. Junior membership costs only £30 for under 8s, £55 for under 14s and £80 for under 18s. We have a range of Adult memberships for students, under 30s, weekday, social, singles, couples and families. For details of membership prices and our application form please visit this page Membership Prices & Application Form . Please come and visit us at one of the UK's most beautifully-located tennis clubs. We're confident that you'll like what you find. Our Facebook page is https://www.facebook.com/GreatMissendenLTC/ and we are sponsored by Hamptons International.